Perhaps the most complete of all the British Edwardian musical comedies, The Arcadians mixed the light romantic and the broadly comic, the picturesque and the spectacular, the musically literate and the music-hall, in doses which caught not only the fancy of its time, but also the imagination of decades. The idea for the show was initiated by the odd little man-about-town and strivingly occasional writer, Mark Ambient, who, finding himself incapable of developing it, took his outline to producer Robert Courtneidge. Courtneidge put his crony and in-house writer Alex Thompson to fleshing out Ambient’s tale, and handed the musical part to lyricist Arthur Wimperis, who had worked effectively on an earlier hit, The Dairymaids, for him, and to two of the most successful theatre composers of the age, Lionel Monckton and Howard Talbot. Postcard advertising the original production. The libretto had errant aviator James Smith (Dan Rolyat), a second-rate London hotelier, bailing out of his aeroplane over Arcadia, an idyllic area somewhere near the North Pole, where truth is beautiful and the lie unknown. When the noble savages who inhabit the place catch Smith in an untruth they are horrified. They dip him in the Well of Truth, changing him into `Simplicitas, an Arcadian’, and decide to accompany him back to the dreadful city of London to spread their message of truth and beauty amongst the English. Amongst a bevy of philanderings and colourful events at Askwood racetrack and at Smith’s Arcadian Restaurant, built to capitalize on the craze started by his newfound friends and his own popularity in his new guise, the lovers of truth and beauty are defeated in their purpose and return to Arcadia, leaving London to its wicked old ways. It was a story which gave the opportunity for plenty of the gentle social satire popular in musical plays of the time, and also for a flock of songs and dances. Phyllis Dare, in the rôle of an incidental Irish lassie, described herself enduringly as `The Girl with the Brogue’ and joined with juvenile hero Harry Welchman in chatting obliquely about the `Charming Weather’ and in deciding to meet at `Half Past Two’. Alfred Lester, in the comedy rôle of the lugubrious jockey, Doody, made a hit with a glum number about `My Motter’ which was, impossibly, `always merry and bright’, Dan Rolyat as Simplicitas sang saucily about the ladies chasing him `All Down Piccadilly’, and the dark-eyed and pixie-faced Florence Smithson in the rôle of the most vocal Arcadian, Sombra, used her dazzling light coloratura soprano to introduce `The Pipes of Pan’ and `Arcady is Always Young’. There was also some particularly attractive and well-written ensemble music in a score that included a half-dozen pieces which would become musical-comedy standards. During the course of the shows’ initial run a number of new songs were tried (and Lester took to singing a verse of his `Motter’ song in French) but only a couple, Miss Smithson’s `The Call of Arcady’ and a topical dance piece called `The Two-Step’, added for Maud Thornton and Harry Ray to boost the show’s dance content, were retained for any time. Gloriously staged under Courtneidge’s own direction, The Arcadians was an instant success, and it settled in at the Shaftesbury Theatre for a run of more than two years (809 performances). By the time it closed, it had already been seen in a highly successful Broadway production, and in cities as far apart as Melbourne, Bombay and Vienna. 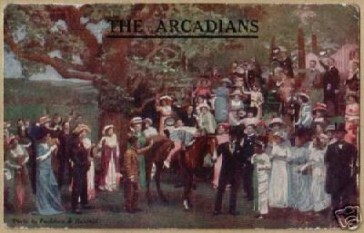 America’s Arcadians, mounted by Charles Frohman at the Liberty Theater and subsequently transferred to the Knickerbocker, starred Frank Moulan (Simplicitas), Ethel Cadman (Sombra), Julia Sanderson (Eileen), Alan Mudie (Jack) and comedienne Connie Ediss in an enlarged version of the rôle of the `abandoned’ Mrs Smith and ran for 193 performances before moving on to cover the rest of the country, whilst Clarke and Meynell’s Australian production, with Maie Sydney (Sombra), William Cromwell (Simplicitas), Essie Perrin (Eileen) and Tom Walls (Doody) proved equally successful, being brought back the following season with Winnie O’Connor starred and establishing the show as firmly in the southern hemisphere as it already was in the northern. 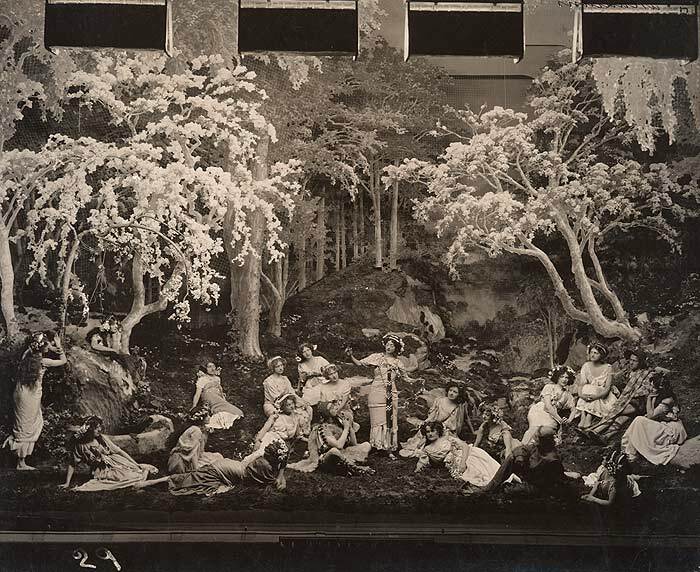 “The Arcadians” in a 1909 staging. Vienna’s version (ad Oskar Friedmann, Fritz Lunzer) of Die Arkadier, with Olga Barco-Franck (Sombra), Josef Joseffy (Simplicitas) and Annie Dirkens (Ella, ex-Eileen) which boasted mendaciously `1,000 performances in London!’ in its advertising, was played at the large music-hall Ronacher, bookended between a flamenco act and an English song-and-dance turn, and took a pause after the first act to allow the audience to have supper. Germany, however, decided on its own Arcadians. Julius Freund `adapted’ the libretto, Rudolf Nelson composed a new score and the resultant piece was mounted at the Berlin Metropoltheater (27 April 1912) under the title Schwindelmeier & cie. In 1913 Les Arcadiens (ad Charles Quinel, Max Dearly) accomplished the rare feat for an anglophone musical of being played in Paris, with Dearly starring as Simplicitas in another music-hall venue, the Olympia, and, only two years later, it returned for a second London season (Shaftesbury Theatre 20 May 1915). The show became a feature of the British touring circuits thereafter, appearing regularly in the provinces for over 30 years, whilst overseas productions continued, and in 1927 its story line and its spectacular scenes (including a second-act finale which brought Simplicitas on stage on the back of a live horse) proved strong enough to warrant it being made into a silent film. In 1984 it was given a major regional revival in Britain under the aegis of Stewart Trotter at the Northcott Theatre, Exeter, and in 1995 it was mounted at the Ohio Light Opera, proving in each case to have lost none of its attractions with the passing of the years. Gilbert & Sullivan Opera Victoria (Australia) did a new production of The Arcadians in 2009 with a revised book by Melvyn Morrow. It was a huge hit. The Company took it to the International G&S Festival in 2011, where it was described by the Organisers as “the hit of the Festival”. There is a good DVD available through the Festival website.